CBS and Showtime had the floor yesterday at the TCA 2017 Winter Press Tour. CBS announced its CBS All Access series The Good Fight, a spin-off of The Good Wife. CBS also announced Carpool Karaoke for Apple Music (iTunes). It was followed by panels with the cast and producers of upcoming CBS series Superior Donuts, Training Day and Doubt. After lunch, Showtime was up. They had panels for I'm Dying Up Here: A Sit Down About Stand-Up In the Seventies, Billions, Guerrilla: The Untold Story of Radicals, Romance & Revolution, and Twin Peaks 2017. They announced that Twin Peaks returns Sunday, May 21 with a two-hour premiere event and 18 episodes have been ordered. Six episode series Guerrilla: The Untold Story of Radicals, Romance & Revolution will premiere on Wednesday, April 19. Showtime also picked-up a fourth season of The Affair. Showtime also picked-up two new series: drama The Chi and comedy White Famous. The return of TGIT - Grey's Anatomy (8:00-9:00 p.m. EST/PST), Scandal (Season six premiere 9:00-10:00 p.m. EST/PST) and How to Get Away with Murder (10:00-11:00 p.m. EST/PST) - has been moved to Thursday, January 26. An ABC News pre-inauguration 20/20 special, America's First Family: The Trumps Go to Washington, will air from 10:00-11:00 p.m. EST/PST on Thursday, January 19, preceded by repeats of Grey's Anatomy and Scandal at 8:00 and 9:00 p.m. EST/PST, respectively. 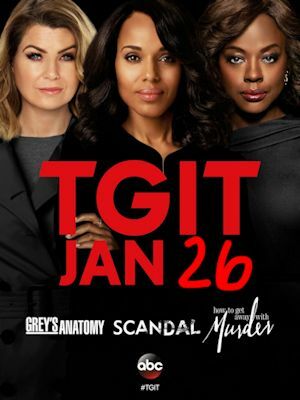 The move was made in order to accommodate the ABC News special and to ensure that TGIT returned with three original episodes. All three were scheduled to return Jan. 19.